Magnitude 6.3 earthquake has occurred close to Ica, Peru on January 30 at 05:11:00 UTC. 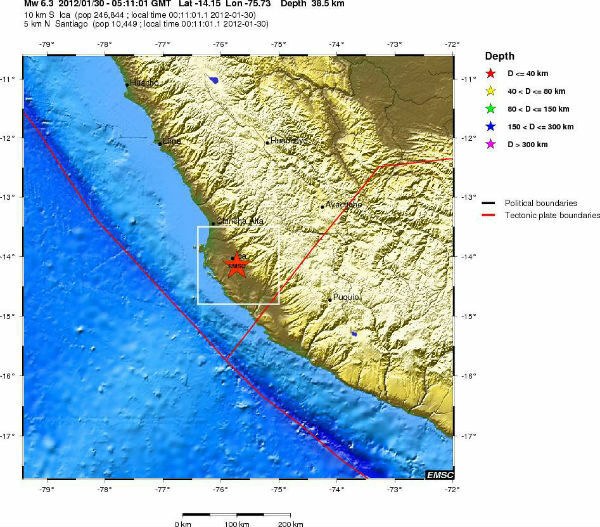 Epicenter was located 5 km (9 miles) SE of Ica, 96 km (59 miles) SSE of Chincha Alta, 172 km (106 miles) WNW of Puquio, 280 km (173 miles) SSE of Lima (14.179°S, 75.644°W) at depth of 39.2 km (24.4 miles) according to USGS. 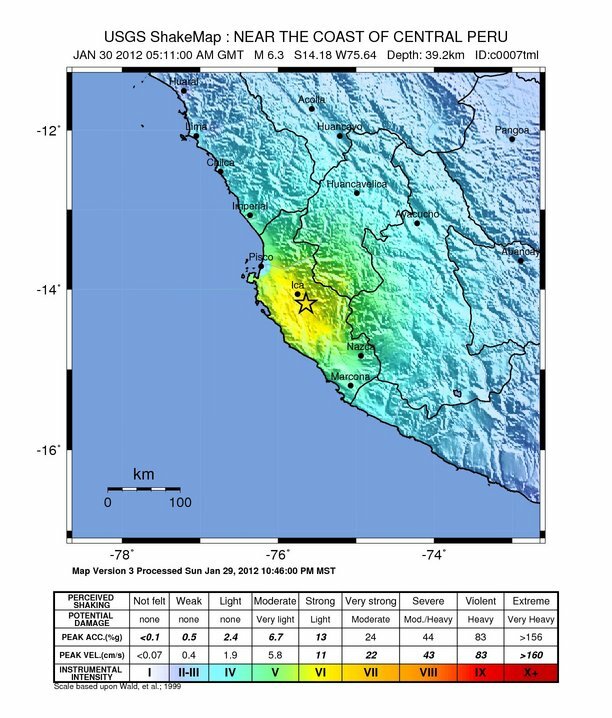 The quake was also felt in the regions of Lima, Ayacucho, Huancavelica, Junin and Arequipa. EMSC registered magnitude 6.3 also but at nearly same depth. According to local media and preliminary damage information provided by Civil Defence authorities, around 100 people have been injured, however most are not seriously injured with only 12 of these severely injured. The quake caused power outages and telephone service outages in Ica, capital of Ica Province, and in the neighboring province of Pisco, but service was gradually recovering, said Civil Defense. Some houses suffered cracks in their structures in slums dominated by adobe buildings, according to unconfirmed radio stations. Many people have been injured during the panic that ensued after the earthquake (mainly from hurrying out of houses given the memory of the past 3 earthquakes. This earthquake has therefore been upgraded to CATDAT Orange. USGS PAGER shows yellow alert level for shaking-related fatalities (some casualties are possible and the impact should be relatively localized). Past events with this alert level have required a local or regional level response. Green alert level is issued for economic losses.